Tolkien made many charts and graphs to help him keep track of all the complicated elements of The Lord of the Rings. In addition to the maps discussed in Part One, we were shown a variety of materials Tolkien created as aids to his writing. They demonstrate that he was continually working out background information for his fictional world. Some of these pieces, like the page we saw titled “Pronunciation of Words and Names,” appear in the published book; others were created solely for Tolkien’s own planning purposes. Tolkien wrote out a handwritten “spreadsheet” tracking the movements of characters in the novel, cross-referencing actions with dates and moon phases. He created a Shire calendar and a conversion chart to work out how the Shire calendar worked together with the modern calendar and those of Gondor and Imladris (Rivendell). These materials were created using a wide variety of paper sources. Tolkien’s charts to keep track of moon phases were written on the back of a printed air raid warden form. While performing his volunteer duties as an air raid warden during World War II, he would keep track of actual moon phases as reference material for his fictional calendars. Some holographs were written on the back of student papers. Likewise, his chart of hobbit measurement systems was written on the back of a menu from a faculty cafeteria. Hobbit measuring is, naturally enough, based on the foot – distances are measured by a step, a toe and a nail. 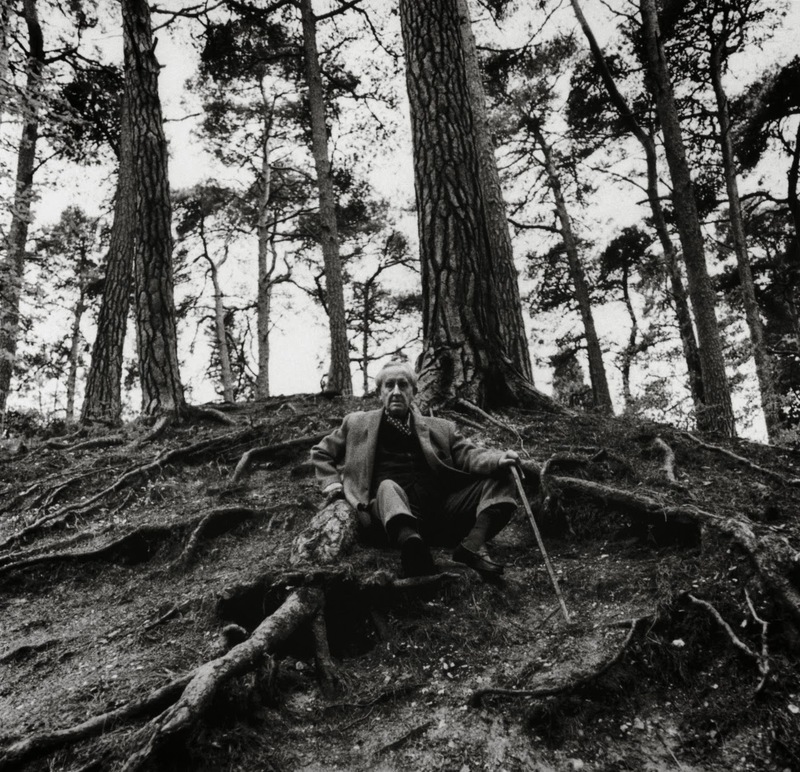 [Tolkien] took lots of ideas from Icelandic folk stories… and he really believed that all of nature was alive. He lived in a kind of adventure fantasy world. The last sentence is the important one. 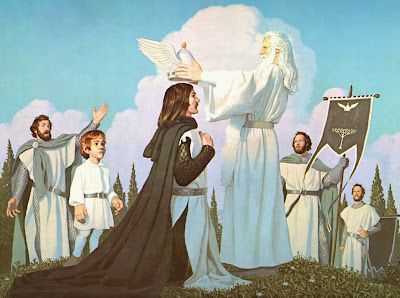 The idea that Tolkien sometimes had his head in the clouds is corroborated by the nature and number of his written works. His scholarly output is completely dwarfed by the amount of material he created for his original mythology, and it’s clear that his heart was in Middle-earth. 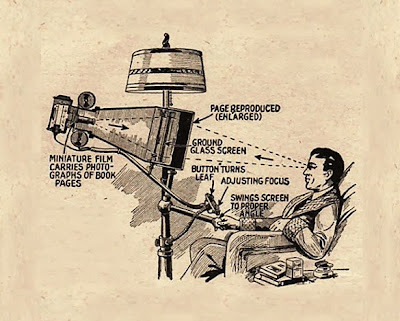 One reading of his short story “Leaf by Niggle” is as an allegory (despite his supposed loathing of the device) of his own creative process. In the story, the artist Niggle enters into a world that he himself created (or sub-created) through his painting. It’s not hard to picture Tolkien’s mind wandering to Middle-earth during his long nights as an air warden or during a particularly tedious academic lecture at the faculty club, and it’s not a stretch to think that he would simply start working out a technical problem of his mythology on the back of whatever paper came to hand. The archivists selected some materials to show us that not everything that Tolkien originally intended to be part of The Lord of the Rings made it into the final published version. As if the multiple endings of the novel weren’t enough, Tolkien wrote a further epilogue that took place fifteen years after the final scene and featured Sam explaining his adventure to his children. As he did with the pages from the Book of Mazarbul, Tolkien created two facsimile versions of a letter from King Elessar (Aragorn) to Sam – one in English and one in Elvish. The letter refers to “Aragorn Strider Arathornsson the Elfstone: King of Gondor and Arnor, Lord of the Westlands.” Interestingly, Tolkien uses the form Arathornsson instead of the “son of Arathorn” formulation familiar from the published novel. The patronymic form is, of course, common in the Icelandic sagas that Tolkien so loved and that so influenced his work. This method of generating a second name for men (father’s name + son) is still used in Iceland today; women are named slightly differently (father’s name + dóttir). We also saw the holograph of what is perhaps the novel’s best-known deleted scene, “The Quest of Erebor.” Along with his rewriting of the “Riddles in the Dark” chapter for the second edition The Hobbit, this is one of the clearest examples of Tolkien’s attempt to retroactively change the continuity of what was essentially a children’s book to line it up with the events in The Lord of the Rings. But who wove the web? I do not think I have ever considered that before. Did you plan all this then, Gandalf? If not, why did you lead Thorin Oakenshield to such an unlikely door? To find the Ring and bring it far away into the West for hiding, and then choose the Ringbearer – and to restore the Mountain Kingdom as a mere deed by the way: was that not your design? Versions of this chapter are now available as part of Unfinished Tales and The Annotated Hobbit, so I leave it to you to read Gandalf’s answer. In any case, this chapter is a clear example of what we now call retconning. Tolkien’s drafts of The Hobbit show that this later explanation was absolutely not in his mind when he composed the earlier work. 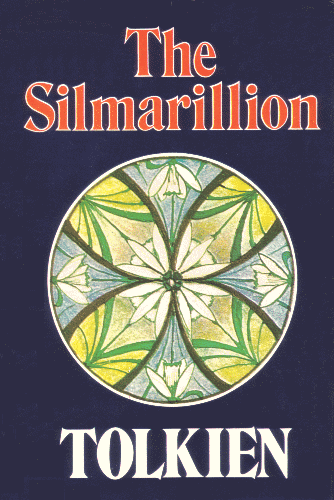 The archives at Marquette only contain two fragments from The Silmarillion, a book which I have always thought of as the Edda of Middle-earth. They were included by accident in a shipment of Tolkien’s manuscripts sent to Milwaukee in the 1950s. Christopher Tolkien used these fragments when writing his record of The Silmarillion’s creation as part of his History of Middle-earth. The fragment that we saw was the “Song of Ainulindalë,” the creation myth of Middle-earth. It doesn’t get any more epic than that. Interestingly, this draft of the first section of what was to become the posthumous Silmarillion compiled by Christopher Tolkien begins with the words “In the beginning.” This obvious reference to Genesis does not appear in the published version, but it’s interesting that Tolkien intended to begin his work with these words – at some point in the writing process, at least. 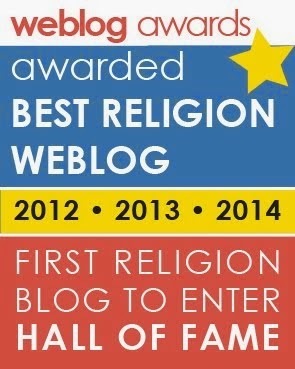 In the end, the dedicated Catholic consciously de-Biblified the opening of what is arguably his major work on the religious beliefs of the inhabitants of Middle-earth. One of my favorite bits of Tolkien-related art was framed and hanging on the wall in the meeting room of the archives. This very large paper (think of a movie poster turned sideways) was sent to Tolkien by the German artist Horus Engels. The German text is handwritten in red ink, but the wonderful thing about the letter is the fact that Engels drew scenes from The Hobbit on the page. 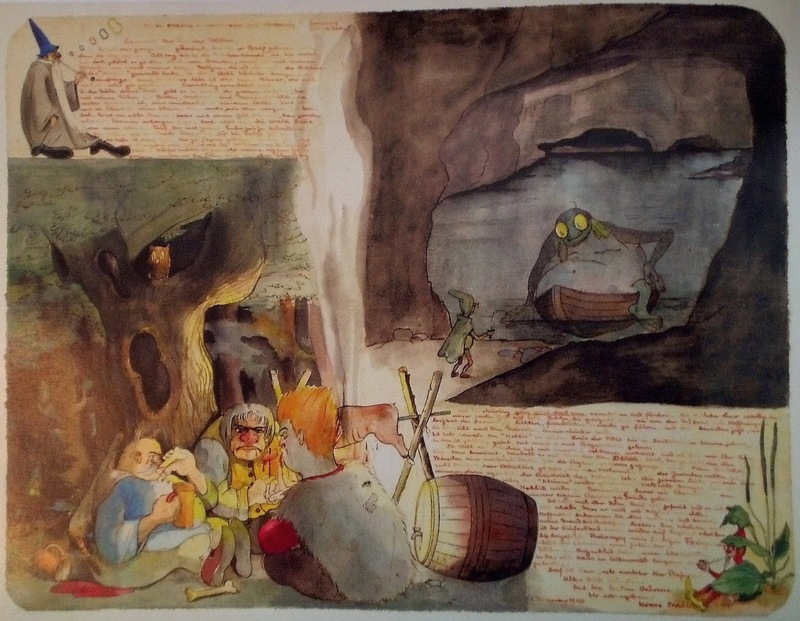 The drawings feature Gandalf blowing colored smoke rings, Bilbo attempting to pick the pocket of one of the trolls, a dwarf smoking a pipe under a plant, and Bilbo speaking with Gollum. The scene with Gollum shows Bilbo stands at the edge of the underground lake as Gollum stares at him while sitting in his boat. Gollum’s island is visible in the distance. The striking thing is that Gollum is portrayed as much, much larger than Bilbo; he’s more like an obese, green, amphibian troll than he is like a hobbit. Remember, though, that this letter was written nearly eight full years before the publication of The Fellowship of the Ring. Although Peter Jackson would have us think of The Hobbit as the prequel to The Lord of the Rings, we should remember that Tolkien had no intent while writing the first book that he would ever create a sequel. There is no sense of Gollum as a warped hobbit in the original 1937 edition; the narrator simply states, “I don't know where he came from, nor who or what he was.” Gollum’s backstory as Sméagol the Stoor hobbit was created for The Lord of the Rings. So, Engels can be forgiven for his strange (in retrospect) image of Gollum. This letter from Tolkien’s publisher ends, “I hope Gondor is all it should be and that you will return refreshed.” Tolkien and his daughter had been in Venice, and Tolkien had commented that the aesthetic of that Italian city was “Gondorian” – an interesting fact to keep in mind when reading The Lord of the Rings and trying to picture the locale as Tolkien himself imagined it. During World War II, Tolkien used whatever bits of paper he could get to write on. Much of it was very poor quality stock. Due to its fragile nature, researchers mainly work with microfilm and photocopies of the manuscripts – unless a detailed look is needed to examine such things as faint pencil marks. The library owns two complete microfilm copies of the entire Tolkien archives that were photographed in 1983. The items in the archives have not been digitized. According to our hosts, digital is not considered a good means of preservation; microfilm is still considered the better format for long-term storage. Amy Cooper Cary, Head of Special Collections and University Archives, told us that no one can guarantee that any digital material will still be readable in ten years (due to endless format changes) but that the stable shelf-life of microfilm is 500 years. This may be true, but it drastically limits access to the archives to those with enough cash and free time to transport themselves to Milwaukee. I worked extensively with microfilm while writing my doctoral treatise on Wilbur Ware. Microfilm is not easy to use, it’s not searchable (except by laborious manual scanning-through of page after page after page after page), and it requires the viewer to be physically present at the archives in question. Our guides told us that “Christopher [Tolkien] views his father not as a writer of modern fantasy, but as a scholar.” I questioned both this remark and the above statement about the longevity of digital materials versus microfilm. I believe that Christopher says this. I believe that microfilm is a relatively stable medium. However, the staff at the archives was very strict that we were not allowed to take photos of any of the material on display – not because photos would damage the objects, but because the Tolkien estate controls the copyright of all material in the archives. Therein lies the crux of the matter. This copyright clause was part of the deal with the original sale of the materials to Marquette. Scholars may come to the archives and study the manuscripts at the discretion of the library, but the estate has control over what may be excerpted or reproduced in published works. This fact places a bit of a shadow over the insistence that poor longevity of digital material precludes making the archives available online. If Christopher Tolkien really wants his father to be seen as a scholar and a creator of serious works – and not simply a maker of revenue-generating pop culture product – he needs to loosen restrictions on the archival material and make it more readily available to scholars around the world. 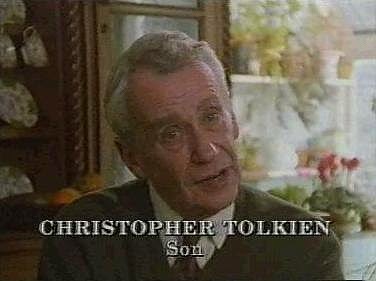 I fully understand that we are dealing with the son of the creator, and I support the idea that the family deserves to reap the financial benefits of Tolkien’s creativity. However, if Tolkien scholarship is really to grow and thrive, a time must come when the family loosens the reins on the material and makes it more freely available for researchers worldwide. If Tolkien’s works are to be studied as great literature – not as genre fiction – scholars must be allowed to treat the holdings of the archives as literary-historical documents, not as the private property of one man’s family. Scholarship on Richard Wagner could not come into its own until his widow Cosima Wagner’s grip on the material was loosened. We may have to wait a while yet for Tolkien scholarship to come into its own. After our tour of the archives, we all had lunch together in one of the library’s meeting rooms. Each person in the group introduced himself or herself and said what class or Tolkien Society he or she belonged to. Each person then explained what drew him or her to Tolkien’s works. Strikingly, nearly all of the women said that their fathers had introduced them to Tolkien’s works when they were little girls, and that the Middle-earth legendarium continues to either be something that they share with their fathers or which reminds them of their dads when they can’t be together. Given the often-made charge that The Hobbit and The Lord of the Rings are boys’ club affairs (which isn’t entirely untrue), it was both surprising and moving to hear so many testimonials of how Tolkien’s works connected fathers and daughters. 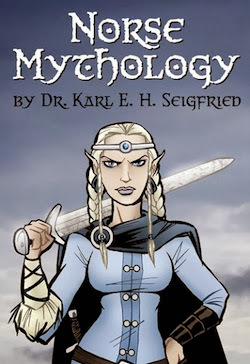 Another interesting item of discussion was the fact that teachers at Wheaton College seem to approach Tolkien’s fictional works as centered on Christian mythology and ethics. In my own courses, while acknowledging Tolkien’s Catholic worldview and beliefs, we spend our time investigating his use and transformation of the pre-Christian mythology of Northern Europe. The Hobbit, especially, almost reads like a tribute to Tolkien’s favorite northern sources. 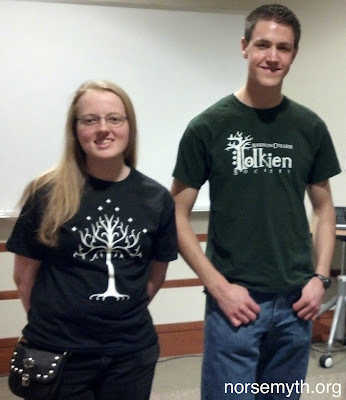 After this discussion, Laura Schmidt (archivist at the Marion E. Wade Center and staff advisor for the Wheaton College Tolkien Society) was kind enough to invite me to present a talk on “’Riddles, Runes and Icelandic Dwarves’: The Hobbit and Norse Mythology” as the 2015 Scholar’s Corner Lecture at Wheaton College. I greatly look forward to the discussion that this talk will spark. 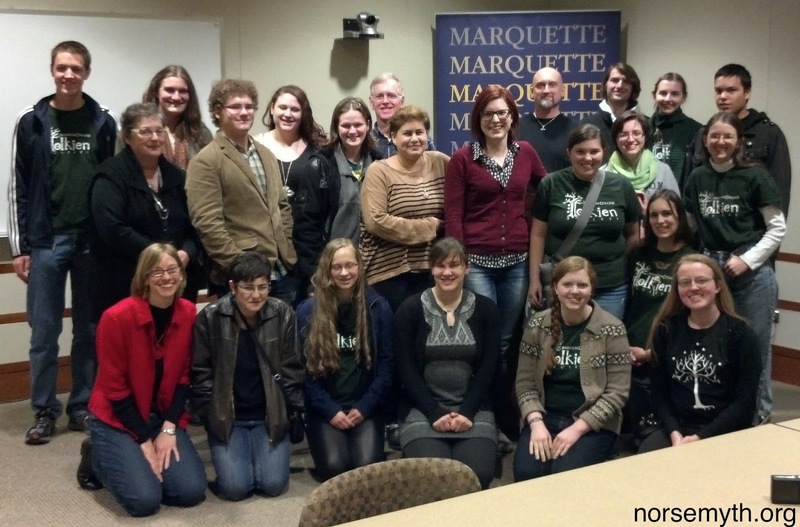 I would like to thank Laura for inviting my students and me to participate in the field trip, and I heartily salute the Marquette archivists for putting together this private showing for us. It was a wonderful experience for students from all three institutions. Skál!